Jomsom Muktinath trek lies in the trans-Himalayan region of Annapurna. The trekking trail follows ancient salt trading and pilgrimage route to Jomsom and Muktinath. The trekking unveils Nepal’s spectacular diversity of landscape, culture and ecology. The region of Jomsom Muktinath was part of Mustang Kingdom for long time in the history. Hence it possesses ruins of ancient forts, caves and monasteries of Tibetan Buddhism as well a pre-Buddhist Bon religion. The area gets very little rain making it the best palce to trek in Nepal during monsoon rain. Means of Transportation: Flight & 4WD overland. Note: Could be custom made with horse riding, village tour, short hikes to suite your interests and time. I arranged a short trek in the lower mustang with this agency. I chose them for the speed of responses to my emails and the ability to tailor their offer to my needs. I got a great price for impeccable, timely and quality services. From arrival to kathmandu airport and until the last day I appreciated the attention that the owners Rabi, Shiva and the Mingmar guide dedicated to me. The 18 mints flight is the best mountain flight as it passes through the world's deepest gorge wedged between Annapurna I (8,091 m) and Dhaulagiri I (8,167m). Jomsom is a small town on the base of Nilgiri Himal. We will mostly follow the river bed of Kali Gandaki to Kagbeni. Visit old Kagbeni with 500 years old monastery. The trail climbs steeply above Kagbeni to the plateaus and then more gradually to another ancient town of Jharkot. From Jharkot, it is 45 mints climb to Muktinath. 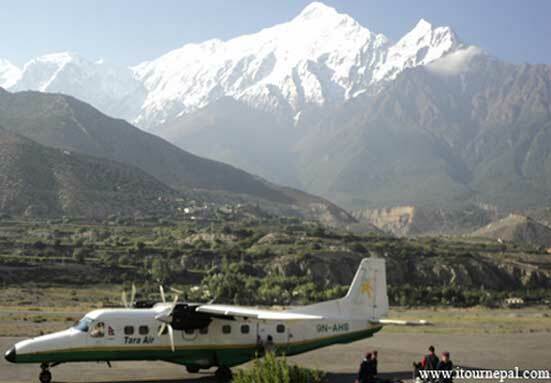 From the altitude of Muktinath, one will be overlooking at Dhaulagiri and Nilgiri Ranges. Lubra is the last Bon village (pre-Buddhist practice). The place is full of legend and history. Also the scenery is beautiful as we first traverse the pasture to come to the ridge closer to Dhaulagiri range. From the point where Panda Valley meets Kali Gandaki,we have to walk back half an hour to Ekli Bhatti. Day 04 : Trek to Tukuche via Dhumba Lake and Tibetan village, visiting some beautiful monasteries along the way. Dhaulagiri seen in the background of Larjung village. Day 05 :Trek to Larjung village and explore the Ghhursanbo cave in the higher reaches of Larjung. Enjoy the great scenery and the waterfalls. Day 06 :Trek or drive back to Jomsom. Day 07 :Fly back to Pokhara. We offer comfortable Muktinath pilgrimage tour with best hotels, transportation, pure vegetarian food and knowledgeable and humble guides. Customize your Muktinath visit with pilgrimage of many other important sites like Pashupatinath and Manakamana. The 1 hr ‘Everest sightseeing flight’ is weather guaranteed. 100% refund in case of bad weather or Everest being no visible. This is the best way to see Mt Everest while you are in Kathmandu, Nepal. The Himalayas obstructs the Monsoon wind from getting to Jomsom Muktinath region. They condense and give heavy rainfall to the south of Annapurna. The air that finally crosses the main Himalayas is rather dry. As a result The annual precipitation of Mustang is only 250 – 400 mm while of Pokhara on the southern slope of the Himalaya is 1,200 – 1,500 mm. It is said that there are more festivals in Nepal than the days in the Calendar. Festivals make the place live and colorful. Visit the place when they are celebrating.